In early November, some friends and I had plans to have lunch at Heirloom Cafe and see the Cindy Sherman: Imitation of Life exhibition at the Wexner Center. But there was a hitch. Veterans Day was celebrated that Friday and OSU, including the Wex, was closed. Bummer. We were physically hungry and art-starved and so we headed instead to the Columbus Museum of Art where we enjoyed lunch at the Cameron Mitchell-catered Schokko Art Cafe overlooking the new sculpture garden and then toured the current CMA special exhibition, Beyond Impressionism – Paris, Fin de Siècle: Signac, Redon, Toulouse-Lautrec and Their Contemporaries. The CMA is the only U.S. stop for this exhibit of more than 100 paintings, prints, drawings and other works. If you are still reading this, you may just be enough into art to know that Columbus is also the only traveling location for the Cindy Sherman exhibit as well. You may be asking yourself just how is humble li'l old Columbus shaking off its Cowtown reputation and pulling off these art coups? I'm not sure, but however it’s happening it’s all the more reason to go see some art. Presented in partnership with the Guggenheim Museum in Bilbao, Spain, the Beyond Impressionism exhibition explores the Parisian art scene, focusing on the most important French avant-garde artists of the late 19th century, including Paul Signac, Maximilien Luce, Maurice Denis, Pierre Bonnard, Félix Vallotton, Odilon Redon, and Henri de Toulouse-Lautrec. This exhibit has something for everyone. Impressionism, Symbolism, Pointillism, the Nabis, and Art Nouveau. My favorite find was Redon, whose displayed works ranged from hybrids of humans and inanimate objects like The Egg to images of fantastic creatures like Pegasus to delicate but vibrant flowers or an imaginary vision of a beautiful boat. If you are like we were the day of our visit, and are overly chatty and many of the pieces lead you to reminiscence about past trips or art history classes taken back in the day when you were in college, you will definitely have a hard time seeing this is one viewing. By the end, we could only briefly walk through the prints by the Nabis, the best known of which are the colorful Moulin Rouge posters of Toulouse-Lautrec. Good thing the exhibit is on view through January 21, 2018 since I need to go back. Museum admission is free on Sundays and the exhibit is only $6 and free to members. I got the stomach flu the weekend after Thanksgiving. Luckily, it really was a stomach bug and not anything related to the turkey day meal itself since no one else was taken out by it. With Caitlin in Pittsburgh for a weekend of hockey and the guys off busy with Blue Jackets hockey and Buckeye football, I was left on the couch recovering - and in charge of the remote control. I’d had the Glen Campbell documentary, Glen Campbell: I’ll Be Me, on my “to watch” radar for years and with Campbell's August passing, Scott Carr’s mention of the film again in his in memoriam piece, and an encore presentation of a story about the making of the documentary that aired on All Things Considered, I felt it was overdue for viewing. If you haven’t heard about this one, it follows Campbell and his wife Kim as they receive his Alzheimer's diagnosis and then embark with a small extended family on what began as a 5-week farewell tour that eventually expanded into over 150 shows across the country over 15 months. While I’m not a huge country music fan, I grew up in the pre-Sony Walkman days of AM/FM radio where the whole country seemed to know the same songs and watch the same few tv channels so I know a few of his solo hits. But before fame struck, Campbell was a studio musician with The Wrecking Crew and he has immense musical talent that transcends genres. At first I enjoyed the film and watching Campbell soaking up the applause from his faithful fans. He was still able to play the music even as lyrics completely evaded him without the teleprompter. But, I couldn’t quite finish it. It was just too painful to watch this man who was the epitome of the alpha male (four times married, the embodiment of the Rhinestone Cowboy and the Wichita Lineman) as his kids kept teasing him forgetting to stay on his mark on the stage or as he had to pee in wastebaskets because he couldn’t remember the way to the bathroom. 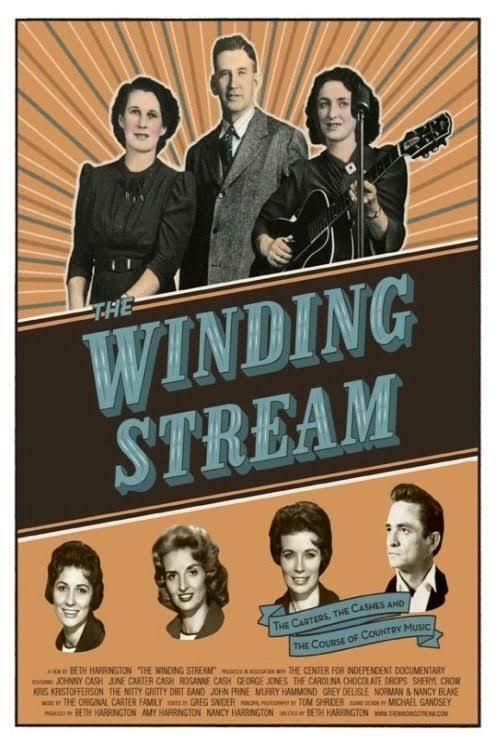 Next up was The Winding Stream, another 2014 documentary, about the Virginia folk band the Carter Family. This quirky little film tells the story using interviews and goofy, but kinda charming, animated still photos intermixed with musical footage. I wasn’t at all familiar with the early story of the start of the Original Carter Family and enjoyed having living relatives tell the tale of how A.P., Sara and Maybelle Carter left the family farm in 1927 to travel to Bristol, Virginia to make recordings in an old hat factory. But what was most fascinating about the early period was the story of A.P. collecting music from all over the country and turning it into songs. On the one hand, old family music that wasn’t recorded anywhere else and may have been lost was preserved but, on the other, no compensation was paid. The film moves through the start of Mother Maybelle and the Carter Sisters, the end of Sara and A.P.’s marriage and her self-imposed exile to marry and live with his cousin Coy in California, June Carter’s marriage to Johnny Cash, and up to the creation of the Carter Family Fold, where you can still go hear their music today in Virginia. Last, but not least, I watched Gimme Danger, Jim Jarmusch’s film making the case that the Stooges were one of the most under-appreciated, greatest rock-n-roll bands of all time. I have to say I expected more scenes of wild mayhem in this movie, but I was good with what I got instead. Iggy Pop, at age 69, looking intensely at the camera and telling the story as clearly he wants it told. And I respect that. I recently heard that reporters are pissed that Robert Plant, out to support his latest solo album, essentially tells them to go get a life when they keep asking him if he plans to write a book. He tells them it’s all between his ears and that’s enough. I get the sense that for Iggy that’s not quite enough but he wants to tell the story his way. What’s there is good stuff (you just wish there was more). Childhood stories, opening for the MC5, working with Bowie, almost making it to stardom but needing to return home broke to his parents’ trailer, and performance footage. One of my favorite moments is when Jarmusch captures the reaction of the Asheton brothers’ mother, as related by their little sister, of when Iggy called to put the band back together 35 years later. “Iggy called! Iggy called and he wants to get the band back together!” says the excited 70-something year old about her 50-something year old sons getting to play with the Stooges again. I love that power of rock and roll.